Wilkes-Barre, the “Diamond City,” was laid out in 1770 by Connecticut settlers in typical New England fashion, with the focus on two public spaces: common land along the riverfront (known today as the River Common), and a central civic square (known today as Public Square). The boundaries of the original town plan encompass most of today’s Downtown Wilkes-Barre. In the late 18th century, the region was claimed by both Pennsylvania and Connecticut, which led to a series of bitter turf battles before Congress permanently awarded the territory to Pennsylvania. Wilkes-Barre was incorporated as a borough in 1806, becoming a city in 1871. The city’s namesakes are John Wilkes and Colonel Isaac Barre, two notable English Parliamentary sympathizers with the American cause during the War for Independence. Wilkes-Barre‘s presence at the center of Pennsylvania’s anthracite coal fields fueled its rise as one of the United States’ great 19th century industrial cities. That prominence is still reflected in Downtown’s built environment; gorgeous structures, such as the magnificent Luzerne County Courthouse , or the Art Deco F.M. Kirby Center for the Performing Arts, continue to grace the streets of Downtown. Want to see more of our historic downtown for yourself? 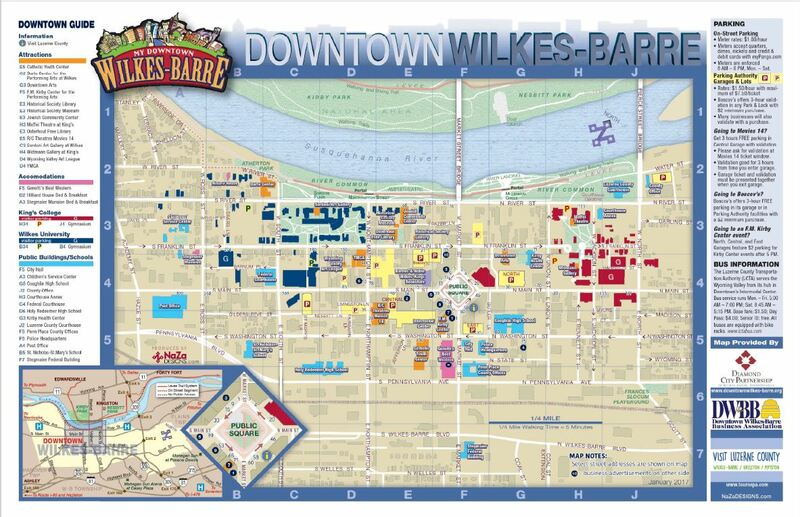 Download our self-guided downtown walking tour, “Walk Wilkes-Barre,” here. If you’re visiting Downtown Wilkes-Barre, and you want to learn even more about the rich history of Wilkes-Barre and the Wyoming Valley, be sure to visit the museum of the Luzerne County Historical Society – Pennsylvania’s oldest county historical society – where a host of intriguing exhibits bring our community’s past to life.